A learnership from SANRAL turned a former domestic worker’s life around. Nontembeko Khenku was struggling to make ends meet as a domestic worker when she came across a newspaper advert for a learnership by the South African National Roads Agency (SOC) Limited (SANRAL). Her life has changed forever. “I’ve learnt how to build access roads, sidewalks and general construction skills. Women must get up, be determined and do it for themselves. They must not be scared simply because it’s a male-dominated industry. Women can also work in construction if they are determined to do so,” said Khenku. 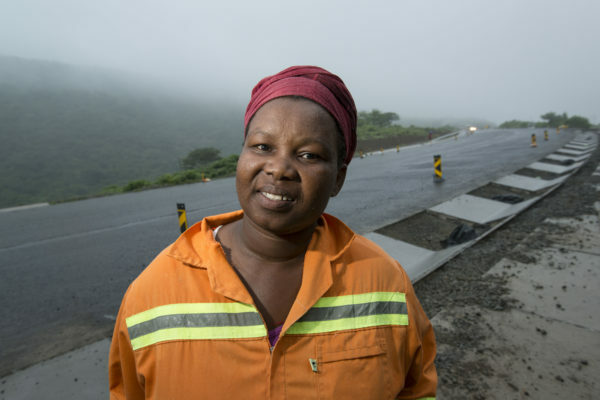 After her application was successful, she underwent a gruelling two-year learnership that helped her make inroads into the tough world of road construction. Khenku is now the owner of Cambeni Construction Company, which is contracted to do work on the R61 near Port St Johns in the Eastern Cape. “I started in August last year. I am a supervisor and we build sidewalks. This will help reduce the number of accidents involving pedestrians walking on and crossing the road,” she said. “In the next five years I’d like to see my company grow from grade 5. It makes me very happy to employ so many people as this helps get rid of poverty,” said Khenku. Khenku said while women face unique challenges in accessing a previously male-dominated sector like construction, there is absolutely nothing that stops them from making a success in this field. Being a woman making her mark in this field initially presented challenges in terms of the attitude of some men who doubted she could deliver because of her gender. “But because I have the skills, I coped very well by using my capabilities. Then they realised that women can indeed do this job,” she said. “I can stand on my own now. I can do quite a lot of things for myself. My family depends on me and we are now a family that is living well,” said Khenku. “I have learnt on the job. I have never worked before and I started working here last week. I’m still very new here. I want to see myself succeed and moving forward in life with the work that I’m doing,” said Ndabeni.